Burning Desire - Write for Wine: It's Wine O'Clock Somewhere!Write for Wine: It's Wine O'Clock Somewhere! Hopefully, you’re now curious enough to read the entire tale in our previous 2016 post: Hard Row to Hoe – Wine with a Story. Believe me, it’s a good one! That’s because talented co-owner and winemaker Judy Phelps not only makes very good wines, but also is smart, fun and a great storyteller. In addition, Judy is a gracious host. We have sent many friends to this winery in Manson, in the beautiful Lake Chelan area. And if they’re lucky, she is at the tasting room pouring a wide selection of her tasty creations. Her wines are numerous and generate rave reviews. For example, wine critic Jeb Dunnuck said “This estate makes a bevy of beautiful wines from the Lake Chelan AVA”. You get the picture! The full list of wines can be found at their website store. 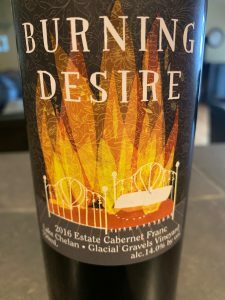 This entry was posted in Cabernet Franc, Cabernet Sauvignon, Lake Chelan Valley, Malbec, Merlot, Pinot Blanc, Pinot Gris, Primitivo, Riesling, Syrah, Viognier, Washington, Wine and tagged Burning Desire, Cab Franc, Cabernet Franc, Cabernet Sauvignon, estate wine, Hard Roe to Hoe, Judy Phelps, Malbec, Merlot, Syrah, Washington wine, Washington wineries, wine, wineries by Margot. Bookmark the permalink.